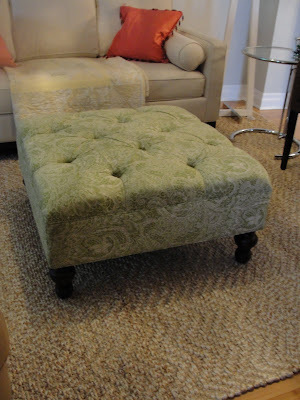 I had been on the hunt for the perfect ottoman for awhile and was just about to go custom when I found this little gem on sale at Home Sense! 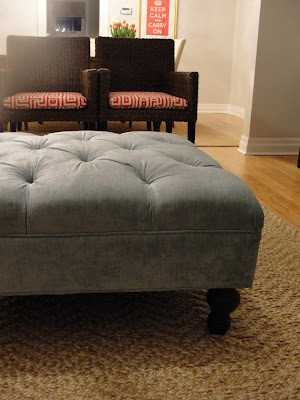 I wanted a velvet similar to the sofa at the Kate Spade store and found this icy blue at Designer Fabrics. I love how it looks with the orange and red that is popping up in our home. Someday (when our toddler is all grown up) this lovely lady may have a tray, a vase of fresh flowers and a stack of books...but for now she is a workhorse. The perfect height for a little guy who loves to play with tractors and cars, a getaway from crocodiles lurking in the pond...and a cozy spot at the end of the day for tired feet.